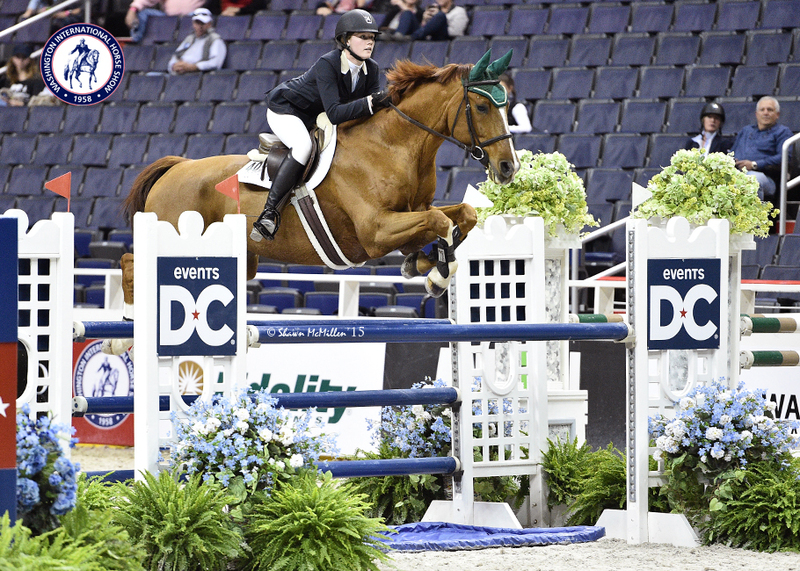 Caelinn Leahy and Esquilino Bay went to the top of the leader board once again as they won the Low Junior Jumper class at the Washington International Horse Show. Photo Shawn McMillen. Maple Park, IL- October 26, 2015- Bellis Show Jumping Stable and trainer Steve Schaefer, continue to move students to consistent top ribbons. Student Caelinn Leahy’s recent win in the Low Junior Jumpers at the Washington International Horse Show (WIHS), is proof of that. Leahy and Esquilino Bay have consistently been at the top of leader boards across the country this year. 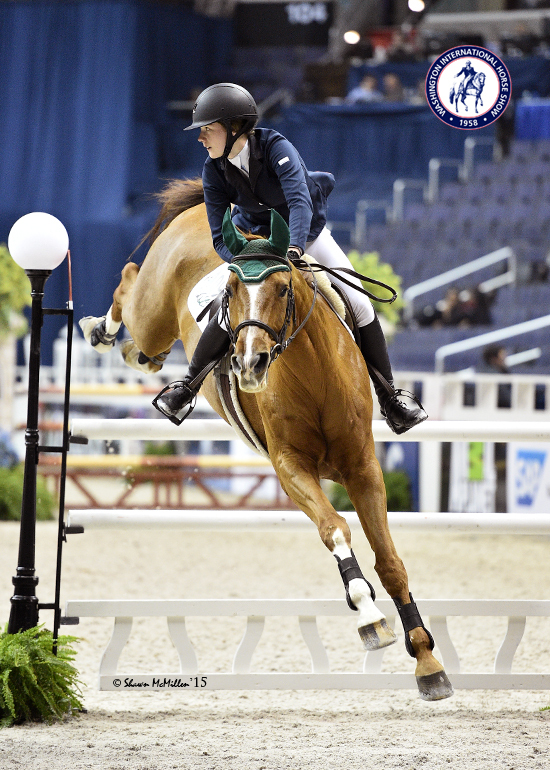 Leahy started the season with a bang, earning the win in the $10,000 Low Junior/Amateur Owner Jumper Classic and the division championship at the Winter Equestrian Festival (WEF) in Wellington, FL in February. The pair also placed second in the Low Junior/AO Jumper Classic week 8 at WEF and landed the Reserve Circuit Championship. The successful team continued their winning streak in May at the Fleur De Lis Classic in TX, winning the $10,000 Low Junior/AO Classic there and continued to Showplace Spring Spectacular in June, where they also won.They started dabbling in a few High Junior Jumper classes, taking third place finishes in those her first time in the division. By summer, Leahy took her first shot at a Grand Pix in the $30,000 Tapestry Farm Grand Prix at Ledges Sporting Horses. By the end of July, she moved into the High Junior Jumpers, consistently earning top four placings. By fall, the pair won the High Junior/Amateur Jumper Classic at the Showplace Fall Classic, earning around $20,000 in jumper prize money for the season. The pair took the second place spot in the NAL standings, qualifying for the Pennsylvania National Horse Show, where they earned a 5th place finish in the NAL Low Junior Jumper Final, her first time at indoors. From there, Leahy and Esquilino Bay headed for the Washington International Horse Show, where they won the $10,000 Low Junior/Amateur Owner Jumper class. As if that weren’t enough, Leahy also rode Kaner 88 and Laura Steffee’s Bloesem, to numerous Low Junior Jumper Championships and Classic wins during the season as well, including WEF. Bellis’ recent success at the indoor championships has been a result of the hard work and careful preparation Schaefer takes to insure his rider’s success. Schaefer works to give riders the confidence and the skills to safely and competently move up to the next level. Additionally, Schaefer works to help riders become competent in their current division. Another key to the Bellis training system is having the right horses for the job. Schaefer pairs riders up with horses that can teach riders what they need to learn so they can safely move up to more difficult divisions. Leahy’s mother, Heidi Schaefer, also rides and pitches in as the groom when Leahy shows, making for a great support system. The Bellis Show Jumping facility has a large jumping field, which Schaefer uses frequently in his program to teach both horses and riders proper balance. His system is successful in every division. Schaefer also has an accomplished resume which includes numerous Grand Prix victories as well as a successful history of bringing along young horses. He is known for his quick jump off skills and his ability to ride difficult horses. His riding skills enhance his instruction, giving Bellis students a competitive edge. Schaefer’s facility features 32 stalls on 45 rolling acres complete with 8 grooming/wash stalls, vacuums, treadmill, heated indoor arena, large outdoor arena, grass grand prix field, group and individual turnout. The farm is located just minutes from I90, I88 and the Elburn train station at 3N452 Francis Road, Maple Park, IL. 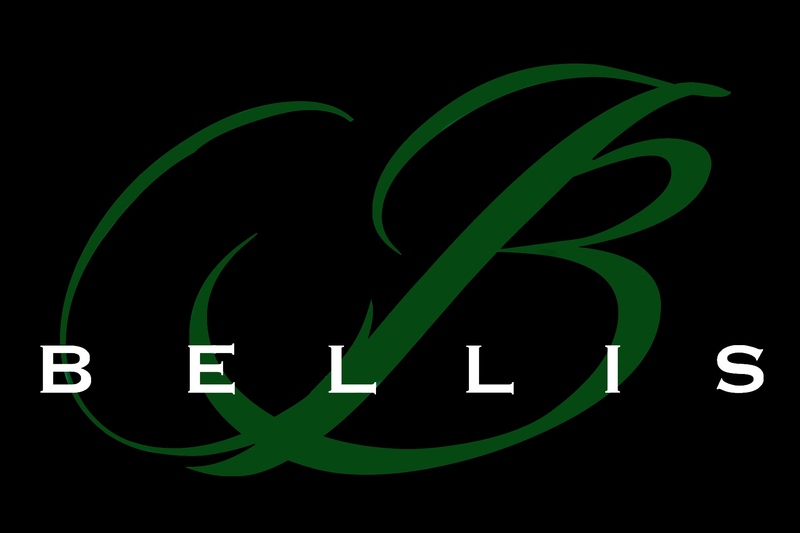 Call to see how Bellis Show Jumping Stable can help you move up to the next level. Lessons from beginners to Grand Prix.